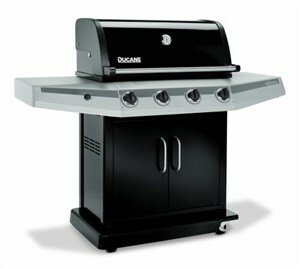 Ducane has been making barbecue grills for going on thirty years now. You would think that would give them a leg up in terms of product development, but the outdoor grill industry doesn’t quite work that way. Man’s been grilling outdoors for a few hundred thousand years, but innovation has been somewhat slow. Of course others have tried to push the envelope, but that hasn’t tempted the folks at Ducane. Instead, they’ve done a good job refining the “middle ground” — the no-frills grill that offers a decent set of features and isn’t too expensive. And there’s nothing wrong with that at all. Their current flagship offering is the Affinity series, which comes in two flavors. Those two could probably best be described as “mid-sized” and “over-sized”, since there’s nothing else that really differentiates them. The 4100 is roughly $100 more than the 3100, and it’s probably worth it if you have the room for it. There’s nothing like having a little extra space available when you’re trying to finish cooking one item while keeping another one warm. Ducane is a wholly-owned subsidiary of Weber-Stephen Products (You know, the one that makes Weber Grills). Both are USA-based, but make most of their grill parts in China. The fact that Ducane is owned by Weber explains why they’ve settled in to produce a middle-of-the-road, “value” line. Weber keeps all of the high-end stuff for their own namesake. Want something more spendy than a Ducane? Try a Weber. Owners generally report good customer service from Ducane/Weber and have had good experiences contacting the company for information and/or troubleshooting. 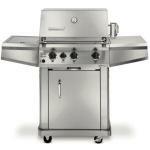 Ducane's Affinity 4100 Propane Grill provides 693 square inches of porcelain-coated cooking grid and 48,000 BTUs of grilling power. That should be enough to keep the burgers coming when friends and family show up for dinner. Add a rotisserie and for slow-roasting poultry and ham.